The TAC Sustainable Urban Transportation Award recognizes a TAC member organization for contributions and innovative approaches to the development and enhancement of sustainable urban transportation. 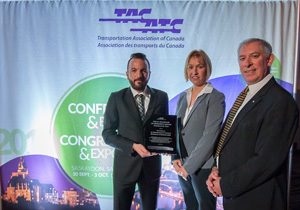 This award was established in memory of the late John Hartman, a former TAC staff member who played a key role in creating the Urban Transportation Council in 1991. A selection committee appointed by TAC's Sustainable Transportation Standing Committee evaluates all abstracts and detailed applications and makes recommendations to TAC's Urban Transportation Council, who provides final approval. Projects that enhance the sustainability of urban transportation through social, economic, and environmental components. Evaluators will use the Centre for Sustainable Transportation's definition of a sustainable transportation system. Social - Allows the basic access needs of individuals and societies to be met safely and in a manner consistent with human and ecosystem health, and with equity within and between generations. Economic - Affordable, operates efficiently, offers choice of transport mode, and supports a vibrant economy. Environmental - Limits emissions and waste within the planet's ability to absorb them, minimizes consumption of non-renewable resources, limits consumption of renewable resources to the sustainable yield level, reuses and recycles its components, and minimizes the use of land and the production of noise. Innovation should be viewed through a "cross-Canada" lens, and related to technical, process (e.g. performance monitoring, consultation) and financial components. Detailed applications should clearly describe how the project or initiative is applicable and/or transferable to other Canadian communities and organizations. Activities meriting added value could include communication and promotional activities, as well as partnerships created or supported by the project.